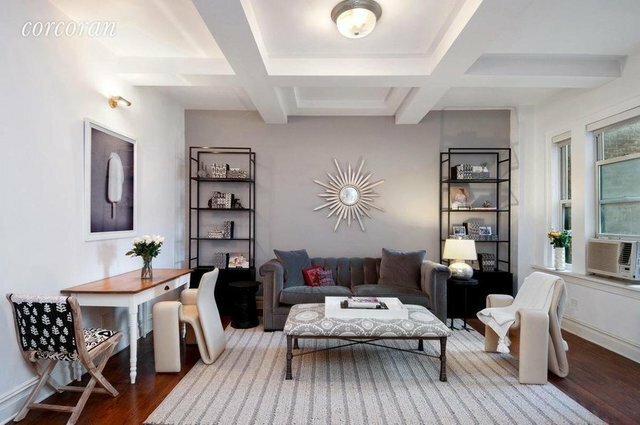 You can have it ALL: Pre War style and modern renovations in a Lower Fifth Avenue condominium! These homes rarely come to market! Move right in to this MINT two bedroom in the heart of Greenwich Village with two King sized bedrooms, and windowed kitchen and bath. Enter this stunning Gold Coast two bedroom through gracious entry foyer, and find high beamed ceilings, beautifully stained hardwood floors, and well proportioned rooms. The elegant kitchen features GE Profile range and convection oven, Liebherr refrigerator, and Miele dishwasher as well as midnight granite counters and custom white cabinets. West facing windows in the two bedrooms (overlooking Fifth Avenue) and East facing in the Living Room, provide bright afternoon light. Perfectly situated on Lower Fifth Avenue with neighboring Washington Square Park, Union Square and Meat Packing, this stunning two bedroom home is in 25 Fifth Avenue, a Full Service Pre War condominium with landscaped Patio, Fitness Center and 24 Concierge and Live in resident Manager. 25 Fifth Avenue is a Full Service boutique condominium in the pulse of downtown. Enjoy afternoon strolls to the Union Square Farmer's market, or drink in a myriad of West Village cafes and bars, or have an elegant meal at Babbo, Mermaid Oyster Bar, Blue Hill, Waverly Inn, Intersect or any number of popular eateries. Condominium package. Pets allowed case by case.